SafeGuard Oral Suspension (Merck) (Compare to Panacur) is a liquid oral suspension of 10% Fenbendazole that contains 100 mg Fenbendazole per ml (Identical to Panacur 10% Suspension which is an Rx product). Safe For Use in Dogs, Puppies, Cats and Kittens: Veterinarians recommend 1ml per 4 pounds body weight be given orally 3 days in a row for control and prevention of tapeworms, large roundworms, whipworms and hookworms. 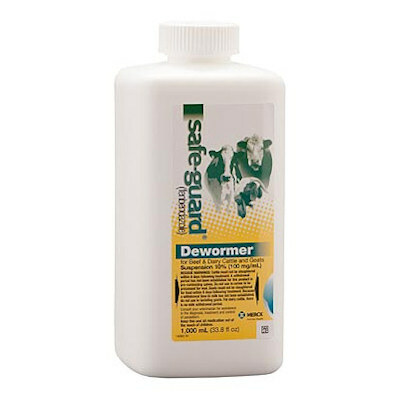 For use in horses use 2.3ml per 100lbs bodyweight for the removal and control of tapeworms, lungworms, barber pole worms, stomach and nodular worms in cattle, sheep and horses. A very effective, econimical and a very safe dewormer. One 1,000ml bottle deworms 43-1,000lb horses. Give Orally with a dose syringe or mix into daily grain ration.